The 2018 International Green Construction Code (IgCC) provides the design and construction industry with the single, most effective way to deliver sustainable, resilient, high-performance buildings. The ‘IgCC-powered-by-189.1’ joint initiative frames the essential sustainable construction building blocks on which future resilient initiatives can develop and expand. By collaborating on developing the 2018 IgCC, the strategic developing organizations supporting it envision a new era of building design and construction that includes environmental health and safety as code minimums. The goal of the 2018 IgCC will provide fundamental criteria for energy efficiency, resource conservation, water safety, land use, site development, indoor environmental quality and building performance that can be adopted broadly. The International Green Construction Code provides a whole systems approach to the design, construction and operation of buildings. The International Green Construction Code includes measures that result in better indoor environments, lower impact on natural resources, better neighborhood connections, and improved walkability. The International Green Construction Code is coordinated with other model codes such as IECC®, 90.1, and many other referenced standards. The International Green Construction Code is a public/private collaboration that provides a green model code to government jurisdictions. As a result, government does not have to take on the high cost of developing its own code and benefits from the code uniformity among adopting jurisdictions. USGBC is developing synergies between specific IgCC measures and LEED® credits, enabling a streamlined approach to leadership that is built on a consistent green code. Green building strategies reinforce societal health/life/safety benefits that building codes offer, providing resilience to natural disasters, climate change, resource consumption/management, and service interruptions due to unforeseen events. Industry-leading codes, standards, and the LEED® rating system have enabled the construction sector to introduce fundamental strategies to protect occupant comfort and health, save money, and preserve resources during the design, construction, and operation of buildings. The implementation of green building design, construction, and operational techniques has increased. Many homeowners, businesses, and building professionals have voluntarily sought to incorporate green building strategies into their projects, and a number of local and national systems have been developed to guide green building practices, including LEED®. Buildings account for over 12% of water use, 40% of CO2 emissions, 65% of all waste outputs, and more than 70% of electricity consumption. Our organizations believe green buildings offer solutions to many of these problems by conserving resources, regenerating sites, and providing economic and societal benefits. The benefits of green building design, construction, and operation should be enjoyed by residents, workers, and visitors of all cities. Our organizations are dedicated to continuously improving the built environment by providing safe, sustainable and equitable buildings for all. Green codes help fulfill the mission of our organizations: To provide for the health, life and safety of the built environment; to increase economic and resource efficiency of buildings; to reduce effects of climate change through more resilient buildings, communities, and cities; and to provide for the best buildings of today without compromising the needs of future generations. Our goal is to transform the market by leveraging the strengths of ICC and ASHRAE to develop the highest standard of green building codes that provide direct connections to the U.S. Green Building Council’s (USGBC) Leadership in Energy and Environmental Design (LEED®) rating system. 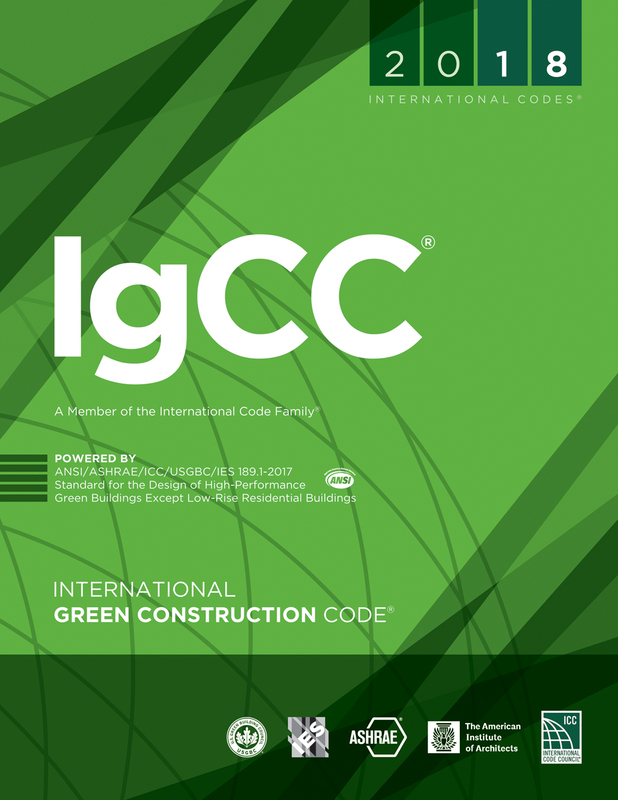 The partnership between AIA, ASHRAE, ICC, IES and USGBC on the 2018 International Green Construction Code (IgCC®) represents the perfect formula for green building codes: The most trusted code development body; the most technically sophisticated HVAC&R standards development organization; the most influential green building rating system; and the design community’s top-tier professional organizations. Our partnership represents model code developers, regulatory adoption agencies, building officials, architects, engineers, the design community, construction practitioners, sustainability professionals, and industry associations. Purchase the 2018 IgCC, released in October 2018.